Arsenal boss Arsene Wenger accused his players of losing their nerve and blamed "suicidal" defending after a 3-1 home defeat by Monaco left them on the brink of Champions League elimination. Goals from Geoffrey Kondogbia and Dimitar Berbatov put Monaco in control of the last-16 first-leg tie. Alex Oxlade-Chamberlain gave Arsenal hope, but Yannick Ferreira Carrasco added a third for the visitors. 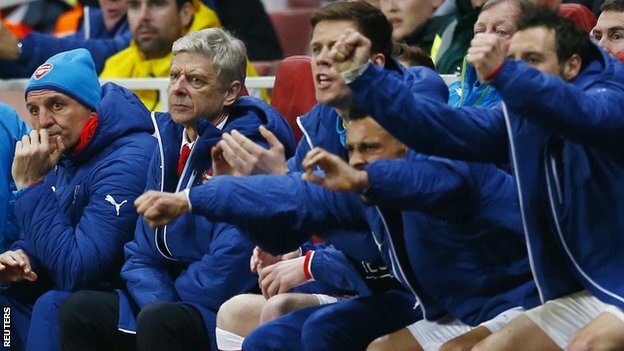 "It is just not right to give goals away the way we did," said Wenger. "We missed chances and were suicidal defensively." Arsenal must now score at least three goals when the sides meet at Stade Louis II on 17 March if they are to avoid exiting at the last-16 stage for the fifth straight season. No side has lost a European Cup or Champions League first-leg knockout tie at home by two goals and progressed since Ajax in 1969. Wenger warned Monaco, who conceded just once and scored only four goals in their group, would play on the counter-attack. But his team were caught on the break early in the second half as Berbatov added to Kondogbia's deflected opener and substitute Ferreira Carrasco netted another breakaway goal in added time. "On the second and third goals, it was suicide," said the Gunners boss. "It looks like we have lost our nerve and our rationality. The heart took over the head and at this level that doesn't work. "Mentally we were not sharp enough. We rushed our game. We knew coming back in at half-time it was important not to concede the second goal, but we were too impatient. It was more heart than brain." Wenger admitted Monaco's third goal could be decisive: "The task is massive now. The third goal makes it even more difficult." He substituted compatriot Olivier Giroud on the hour mark after he missed the target with six efforts: "It looked like it was not one of his best days." Former Spurs striker Dimitar Berbatov: "It was a great success. We fought like a team, we scored our chances and it's a great result. "Probably the only people who believed we could do something good today was the players and the coach. I know how the good players are that we have. They are young players, but they have good quality. "It is a big step but nothing is over because Arsenal are a very dangerous team. When the next game comes, we will try to prepare and not allow them to score the goals they need to score." Monaco coach Leonardo Jardim: "No-one really thought that this result would have been possible, but we achieved it. However, Arsenal are a great side and we are only halfway through this knockout tie. "Football is a team game and we know individual players are important. We were able to nullify their threat. We were very organised and, as I said we would, we were also able to attack with a lot of quality." Former Arsenal defender Martin Keown on BBC Radio 5 live: "The team is not professional enough. They get too caught up in the moment. "It's one thing to identify the problems, but it's another thing to make the necessary changes. Big decisions have got to be made, but Wenger loves every player and treats every player like his son. He's got to be ruthless for the benefit of the team."